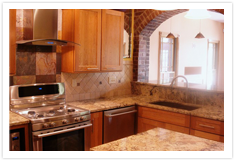 The focus of Building Technology LLC is custom home remodeling at a reasonable price. We understand the need for homeowners to remodel and add onto their existing homes without it costing an arm and a leg, so we will work with you throughout the remodel to ensure we stay on budget. Whether you're looking into new flooring throughout your home or adding on a deck to complete the look of your backyard, Building Technology's skilled team of tradesmen will handle the project with efficiency and attention to detail. Have you been searching for a remodeling contractor you can trust? Call Building Technology at 314-382-1321 to discuss your upcoming remodel.